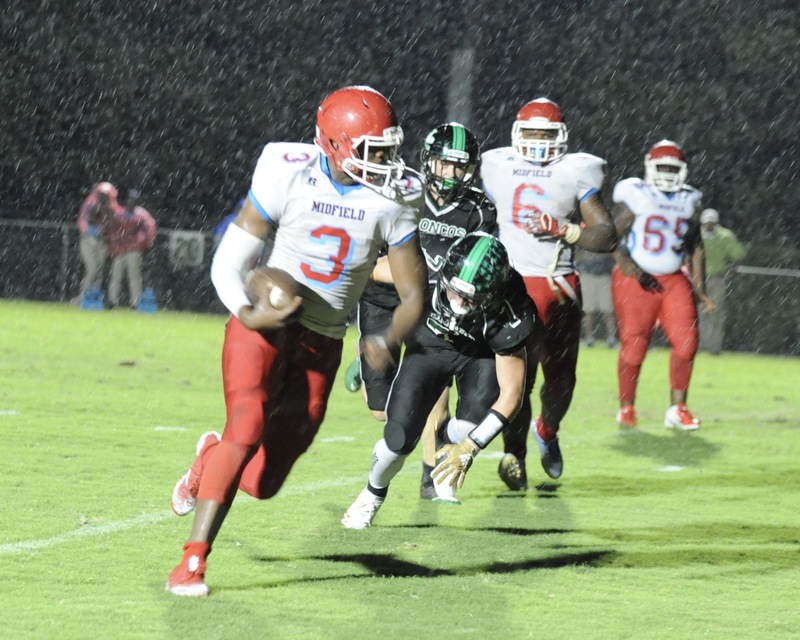 HOLLY POND – The Holly Pond Broncos (Class 3A, Region 5) came back home Friday to host their most powerful opponent yet, coming up short against the Midfield Patriots (Class 3A, Region 5), 36-30. Holly Pond started sluggish on offense, turning the ball over on downs and giving Midfield good field position. The Patriots took the advantage all the way to the end zone, scoring the first touchdown of the game with a conversion. As Holly Pond got the ball, they gained ground with Kyler Chaney handling most of the carries. However, Midfield held the Broncos back and, once getting the ball, began to drive all the way back for a second touchdown. After another conversion, Holly Pond got the ball but was unable to carry it far enough before the quarter ended. At the end of the first quarter, Midfield was up 16-0. In the first three minutes of the second quarter, Holly Pond continued to struggle, giving up another punt. The Patriots then drove for yet another touchdown to make the game 22-0. When the ball went back to Holly Pond, the Broncos began to move the chains, scoring their first points of the game. Midfield got the ball back and attempted to move it the way they had been doing, but Holly Pond blocked them entirely. After getting the ball back, Holly Pond took it all the way to the end zone with a conversion alongside. On the next Patriot possession, they lost a lot of yardage on two snaps that went over the quarterback’s head, the second of which led to a turnover and another Bronco TD. This sudden rush from Holly Pond brought them back into the game. At the half, the score stood at Midfield 22, Holly Pond 14. Saints fans would appreciate the Broncos’ nerve as they opened the third quarter with an onside kick that they recovered to start the half with the ball on the Patriots’ 45. The strong running game picked up where it left off in the first half and carried Holly Pond into the end zone. A successful conversion tied the game 22-22. Midfield’s first series paused abruptly with the referee calling a lightning delay at 8:43. When play resumed at 9:20, the Patriots got off one play before having to punt. Holly Pond ended up with the ball on its 48. The Broncos drove down the field but stalled just short of the end zone, turning the ball over on downs inside the Midfield 1-yard line. The Patriots finished the quarter inside their own red zone, with the score still tied, 22-22. The Patriots opened the fourth quarter strong but stalled short of the 50 and had to punt. The Broncos stampeded back with impressive running displays from Holly Pond running backs Jeremiah Holmes and Tyler Simmons in a touchdown drive that put Holly Pond up 30-22 after the conversion. After Midfield got the ball back, the Patriots hit a long pass to make it first-and-goal before tying things up 30-30. The Broncos took the kickoff deep in their own territory and couldn’t get things moving in time to avoid a punt. The punt, though, was a long one, leaving the Patriots to start on their own 26-yard line. Another long pass and run play, though, put them back in the red zone and another touchdown made the score 36-30. The Broncos’ last drive stalled in their own territory with less than a minute to go and Holly Pond came up just short, 36-30. Holly Pond travels to Hanceville (Class 3A Region 5) to take on the Bulldogs next week.